Their tagline "Live the good life" best describes what La Vida Casino is all about. 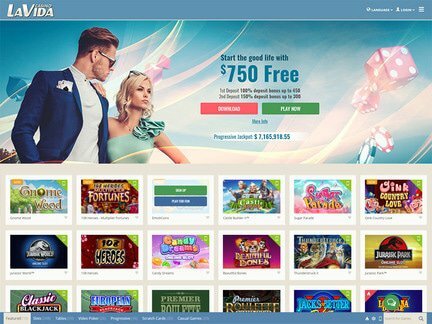 Founded and managed by Club Red Gaming, which is the same company behind the top-rated establishment Red Flush Casino, it boasts of impressive graphics, a wide selection of games, multiple promotions, professional management team, high-tech security and a software provided by Microgaming. All these make La Vida Casino a top-notch gambling hub. Games at La Vida Casino can be played through a downloadable version or the instant play one. This means users of both Mac and personal computers can access the site. In addition, user-friendly features are installed, such as flawless functionality, high-quality audio and video and the ability to preview transaction histories. Players can also engage in games in multiple tables. A review of their game library saw that it is very massive and includes some of the best games in online betting. Table and card games, video poker, and various kinds of slots are all available. Presently, there are at least 500 games at the site waiting for players, and every month, there are new titles released. It is also worth noting that their progressive jackpots are very rewarding. This kind of jackpot is offered in table matches and slot machines as well as video poker. Since they are pooled with most casinos backed by Microgaming, they grow rather swiftly. When depositing money, you can either use British Pounds, Euros and American, Australian and Canadian Dollars. You can make your transactions via credit and prepaid cards, e-wallets and other bank transfer means. There are a lot of methods to select from so you will have no problem going about your transactions. One thing that may not sit well with players is the withdrawal limit every week if they win more than 5 times above their total deposit. You may need to wait for a little while to claim your winnings especially if it is from a high-stakes match. The casino makes use of a 128-bit encryption to secure the gaming arena. La Vida Casino has also been certified by eCOGRA for its fair play policy and random number generator. Their payouts are also regularly audited. Kahnawake Gaming Commission granted the establishment's license and is very strict in enforcing that all gamers should be 18 years old and above. Impeccable customer service is available 24 hours a day, seven days a week at this place. The staff will address any concerns via e-mail, phone or live chat. Moreover, aside from English, the representatives are conversational in multiple languages including French, Spanish, German and Italian. Furthermore, there is a host that caters to high-roller clients.